The Purge by way of Poshmark! Back in January I started my journey of letting go. But this letting go was a little different than usual. This letting go required me to face reality and my closet. For a woman this can be dramatic. We all keep things entirely too long. We’ll buy a pair of shoes and wear them once and they will never get to see sunlight again because they tore our feet up that one time. Or we may have old jeans that we swear we are going to get back into one day, when really we won’t. One year block heels are in and they next they are out. We go from pointed toe shoes to square to round trying to keep up with the latest fashion. All of this, plus more, has left me to needing to declutter. I’ve mentioned before how I’ve had separation anxiety even when it came down to material things. Now, don’t get me wrong. I’m not a hoarder by any means. I don’t collect junk (sorry if I offended you) but if I’ve paid good money for something or if I’ve had something a long time, I often find it hard to let go. I had shoes in my closet that I had not worn in five or more years. Not only was it time to let go but I was running out of room. I thought I would try selling a few of my clothing/shoe items online. I posted a few things on Ebay in hopes of selling a few pair of shoes just to test the waters. Nothing happened. I mean no clicks, no likes, no offers. I felt like I was amongst senior citizens in a public library my page was so dry. I knew then that I would need to find another means of doing business. After that big failure I decided to try Poshmark. Again, I didn’t know what to expect but I really had nothing to lose. To start, I posted a few pair of shoes and a few clothing items. The buyer has the opportunity to purchase your item at the amount you list it as with no questions asked, or they can offer you a price and it’s then up to you if you are willing to accept it. So the ball is always in your court. Once I saw that people were interested in what I was posting, I then decided to add more of my items, including purses. FYI: I joined on a Sunday evening, by Tuesday of the same week I had already sold 3 things! I’m not telling you who to do your online business with but let me just say that Poshmark is the place to be! When posting on Poshmark your listed items are then placed into what they refer to as “your closet” and I was adding items to my closet daily. Later, I would invite my mother, sister, and aunt to join Poshmark with me and their closets have been in high demands as well. We often joke and say we’re working in our store and that it’s our side business! When I first started posting, I felt bad for listing items at such high prices. 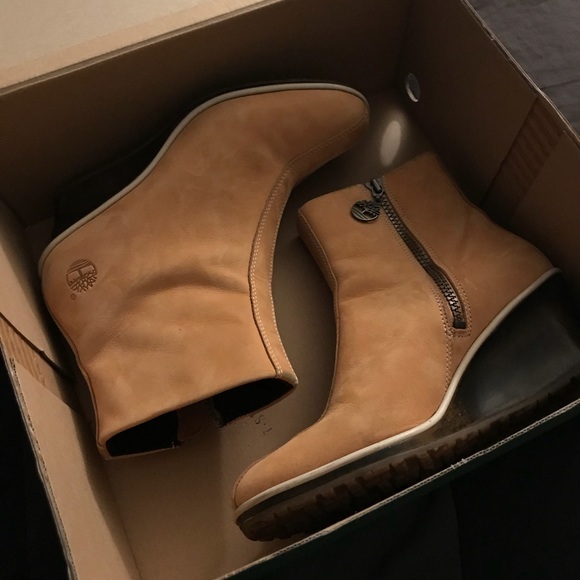 For instance I had a pair of casual/dress Timberland® boots that I literally only wore twice. They looked brand new. The heel of the shoes weren’t even dirty. I listed them for $25. Now that I think about it, I could have listed them for at least $35 and they probably would have sold for that price. In my mind, I’m thinking I’ve had these shoes for at least 6 years. Twenty-Five dollars is better than nothing! But I’ve learned to never underestimate what someone else is willing to pay for your items! What I love most about Poshmark is that it’s easy. Poshmark does most of the work for you. All I have to do is post my items to my closet. Once someone decides to make a purchase, Poshmark will send me a label to print. I have free boxes shipped to me from USPS (learned this through Poshmark), I add a nice “Thank You” note to the buyer, attach the prepaid label (the buyer pays for shipping) on the box and drop if off to the post office OR I can arrange for USPS to come and pickup the item for FREE (also learned this through Poshmark)! Once the items are delivered to the buyer and it is accepted on their end, Poshmark then deposits the money into my Poshmark account. At any time, I can have that money deposited into my bank account or I can let my account build up. It’s really that simple. So, if you’re looking to purge and get rid of some items that you no longer wear plus get paid for it….join me on Poshmark! You’ll be surprised at the number of things that you haven’t worn in years. I was also surprised when I found new items still in my closet that had tags on it. Today, I’m still adding to my closet. Every closet in my house is subject to be purged! If you believe that you have items to sell or if you’re on the other end of the spectrum and is interested in shopping, join me on Poshmark. Use the code LUVLYTOY at sign up to receive $5 off your first purchase. Ahead waits your chance to get rid of old items while building your bank account. You can access my personal closet HERE. Hint: If you’re looking to buy some authentic name brand items; Gucci, Prada, Chanel, etc. etc.–visit Poshmark! This post is based on my own opinion. Next article How “woke” are you?